The Heyworth Public Library has recently added a teen art class for this summer. Join the Mclean County Art Rover Program for a session on 3-D art for teens on June 25 and 26 from 10:30 a.m. – 12:30 p.m. in the library. The class is free for 11 – 18 year olds. Ms. Kelly Robertson will help students explore how masks have been used throughout time in many cultures to tell stories—whether to warn children of dangers, share legends, or to teach historical events. They are also used to disguise or transport us to other worlds in theater. Think of a mask you would like to create that you can connect with; the character can be fully imaginary or can be based off of someone or something that already exists. We will be painting, collaging, and gluing onto mask bases to create our finished pieces. Limited space, sign up necessary. Have you been in lately to visit the “House of Blues” with cool tunes and hot reads? Read to the Rhythm 2015 is underway! Sign up for programs today and begin reading for prizes on June 6th through July 18. National research from Dominican University finds that students who participate in public library summer reading programs scored higher on reading achievement tests at the beginning of the next school year than those who did not participate. You can access all our programs on our website at heyworthlibrary.com, choose the “What’s Happening” link, then “Programs”, and select “Summer Reading Programs”. We have listed all our classes and programs. We also use Google calendaring, so save time and sync our calendar to your Gmail account. Or visit the library and pick up a program guide. Get these dates on your calendar today, and prepare to Read to the Rhythm all summer long! If you can’t attend programs, children age 3 through 103, can still read for prizes. We have also “triple dog dared” students to read more than their parents this year, summer reading is for the whole family. Reading for prizes begins June 6 – July 18. Only Heyworth Public Library materials count (books, audiobooks, and magazines) for reading to earn prizes. So make plans to stop in on June 6th or after. Also a reminder that our Tuesday hours change in the summer. In June, July, and August we are open 10 a.m. – 5 p.m. on Tuesdays. All other hours remain the same year around. June 6 – July 18 Begin reading for prizes – All Ages! Open Craft Night, 1st and 3rd Mondays of each month, 6:30 p.m. -7:30 p.m. The Knitting for Beginners program will take a break this summer (June – August) and start back up again in the fall. However, knitters and crafters who would still like to meet and socialize in the library every 1st and 3rd Monday from 6:30 p.m. -7:30 p.m. are welcome. Monday Evening Book Club, 4th Mondays at 6:30 p.m. Would you like to start your own book club with a group of friends? We can help with book selection and loan the books you will need for your group. Stop by today and ask for details. Friday movies, 10:30 a.m. every Friday in June and July. For a listing of titles being shown please stop by the library for a flyer or visit our website. Bring your own snack and drinks with a screw cap lid. Heyworth History Club, 4th Wednesday mornings at 10:30 a.m. All are welcome to join us in collecting and preserving Randolph Township history. 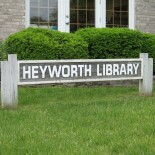 June 24 Heyworth History Club 10:30 a.m.
For all programs and more, see our website at heyworthlibrary.com. If you would like to attend a program, please call the library at: 473-2313. This entry was posted on June 4, 2015 by Heyworth Public Library District.